A 7 year old liver chestnut stallion standing at 15.1 1/2 hh being 50% Welsh Sec B by Greigiau Copper Tornador out of an ID/TB mare whose breeding goes back to the Thoroughbred Top Star who sired some very good jumping horses. Cwrtycapel Copper's Image, who is known as "Charlie", is the 5th generation bred at the farm and was selectively bred for temperament, conformation and correctness. 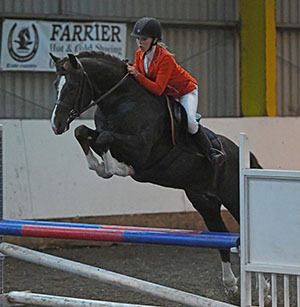 He is a working stallion who has been very successful in-hand showing and in ridden dressage and show jumping. 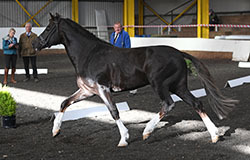 Sire: Greigiau Copper Tornador is a WPCS Sec B who has won Bronze medals, been Supreme Champion numerous times in hand and is also a Champion driving pony. His daughter has won numerous championships in hand showing as well as Champion Lead Rein and First Rdden. His sire, Eyarth Rio, was Champion Royal Welsh Show, Champion Royal Show. and the highest placed pony at Wembly Roy Creber final as well as being in the top ten Sire ratings for many years with the WPCS. Dam: Trehwfa Blackbird is 16.1hh 50% TB and 50% Registered Irish Draught (RID) out of HIS mare Trehwfa Vicky. Blackbird’s pedigree goes back on her dam line to Top Star (by Arctic Star) who has sired some very good jumping horses. Her daughter (by Prince Nazeem) has been graded SHB(GB) and she gained Reserve Supreme Champion in her first ridden show. Her sire, Householder, was an Irish bred TB son of Home Guard, whose progeny won nearly $7M racing. Damsire: Hang On Johnny is a RID whose grandsire is the great Ben Purple, the damsire of Sydney Olympic gold medallist, Custom Made. 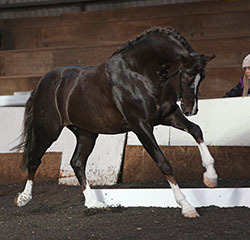 Cwrtycapel Copper's Image is a working stallion. 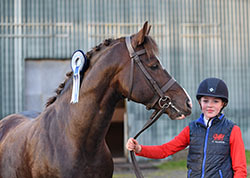 He was shown in hand as a youngster and gained Supreme Champions, Champions, Reserves and many placings too numerous to mention in WPBR, Hunter and Sports Horse classes. 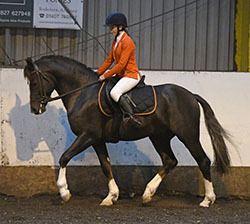 He has also been successful in ridden classes, has won and been placed with good scores in dressage including competing in pairs dressage, with a mare, gaining a first place. Charlie has also been show jumping, winning several clear rounds up to 100cm and he has also been cross country. He is now being competed by a 13 year old girl and his owner has high hopes for them as a combination. Charlie has an excellent temperament which he is passing on to his progeny, who are tall elegant foals, with size, quality and substance to perform in any discipline. He is very kind to his mares, and would cross well with any type any size mare.